2. Roast the beetroot for 45 minutes with 1 tablespoon of the sunflower oil. 3. Cook the quinoa as per the packet instructions, including the bouillon powder, then set aside. 4. Heat the remaining sunflower oil in a pan until hot. Toss in the garlic and leeks and saute on a medium heat for 2 minutes. Add the juice of half a lemon and the measured water. Once the leeks have started to absorb some of the water, add the kale and stir. Next, add in the juice of another half a lemon along with a pinch of salt. Cook for 2-3 minutes until the kale is wilted and soft. Remove from the heat. 5. 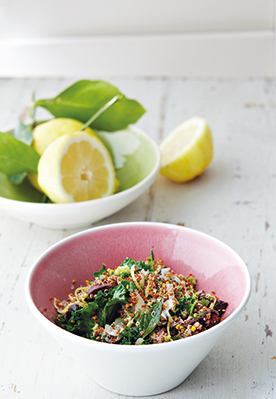 Assemble the ingredients by mixing the kale, leeks and beetroot through the quinoa, then gently fold in the broccoli, lemon zest and herbs. 6. Mix through the remaining lemon juice, za’atar, mirin, sesame oil and brown rice vinegar. Finish off with a beautiful garnish of bee pollen, if using.